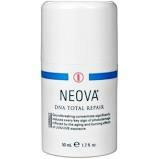 Neova DNA Total Repair is an advanced formulation that targets and corrects photo-damage caused by UV exposure. DNA Total Repair while increases your skin's ability to defend against environmental aggressors that can cause premature aging. DNA Total Repair helps to firm skins elasticity and has antioxidants to stop DNA damage.